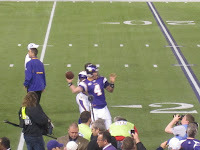 Today Brett Fave ISN'T starting as QB for the Minnesota Vikings. 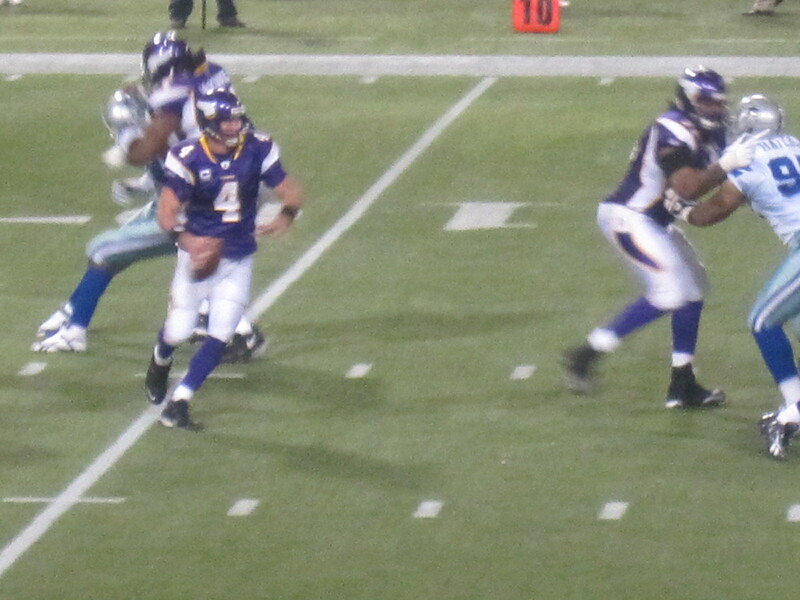 In fact, after the hit he took in last week's game, I'm pretty sure that he's even playing. 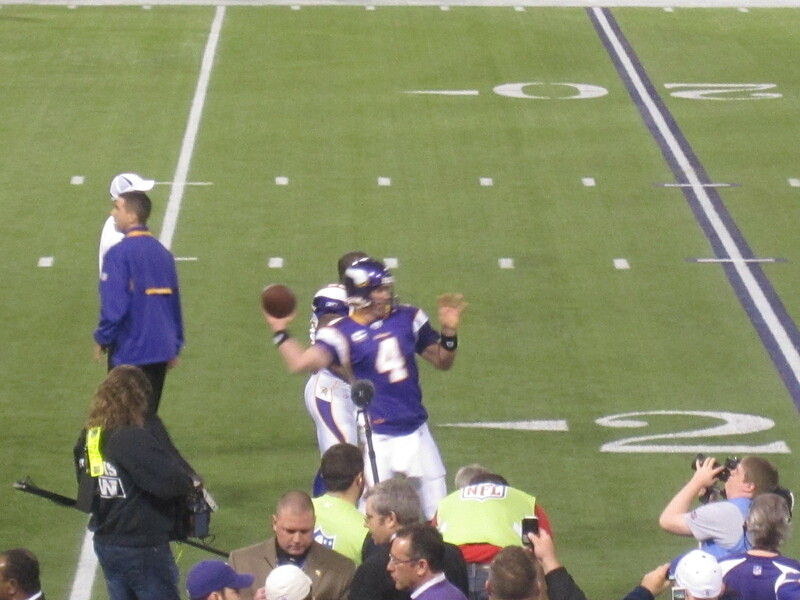 Tonight's New York Giants v Minnesota Vikings game is being played in Detroit, since the Metrodome's roof collapsed due to the weather in Minneapolis. Brett Favre's streak. that began in 1992, ends tonight at 297 consecutive starts. I was in Detroit this morning. Normally, I fly direct to Minneapolis. This morning, the Delta counters were a disaster. and I dealt with the most unhelpful woman at the Sky Priority counter at Reagan National Airport. I've already complained numerous times to Delta about this experience, and hopefully I'll have a positive outcome to report once Delta reviews the case. Regardless, I was routed through Detroit. Once I landed in Detroit, I listened to my voicemail and learned that my customer wouldn't be at work today. **** Remind me why I even traveled this morning?!?! After hearing the voicemail, I contemplated giving away my seat, so I could go to the "impromptu Monday Night Football" game tonight. 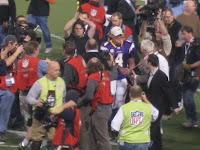 When I was at the Detroit Airport I saw Vikings fans at the airport. 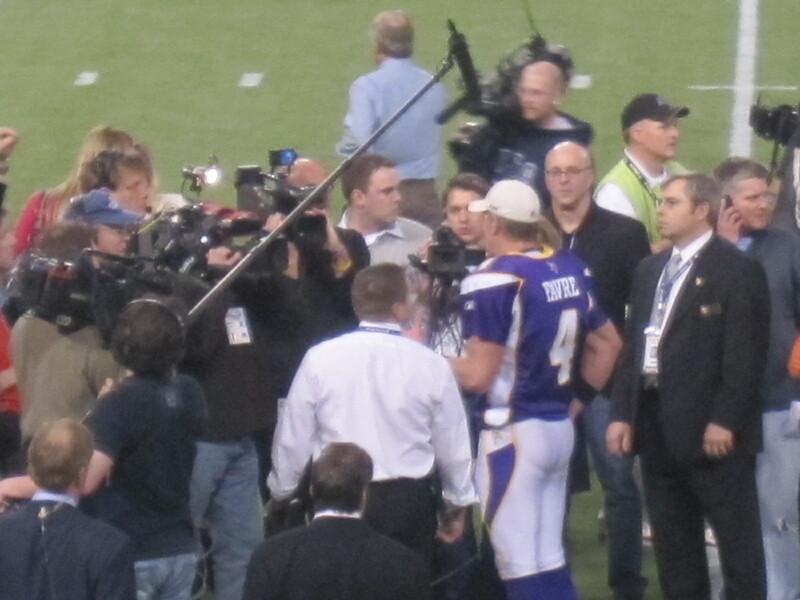 When I landed in Minneapolis, I passed the gate for Detroit and saw even more people in Vikings attire. Considering how late the flight got me into Minneapolis, and my Delta travel woes ~ I probably should've stayed in Detroit, visited the Detroit Lions' home field (i.e. Ford Field), and watched someone else (i.e. 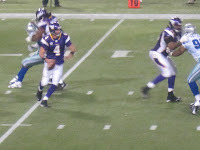 Tavaris Jackson) start as QB. However, I couldn't get "down" with the cold in Detroit (i.e. or Minneapolis for that matter). Plus, after just watching the Minneapolis local news report it looks like people lined up early so the free tickets were distributed rather quickly. Lastly, if I heard it correctly, Sun Country Airlines filled up four charter flights to Detroit today. 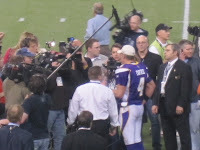 **** Pictures of Brett Favre are the ones I took at the NFC Wildcard game, January 2010.